Is it Wise to Opt for a Tree Trimming in Hinsdale, Illinois? While trees can do a lot for a yard, there is a limit as to how much tree is too much tree. When trees grow out too much, they begin to negatively affect their surrounding area in a number of different ways. At some point, a good old-fashioned tree trimming will be necessary. Wondering if you should opt for a tree trimming in Hinsdale, Illinois? Read below to determine whether or not one is in order. In a lot of ways, a tree trimming is like a haircut for your yard. By cutting away long, overflowing branches, you reduce the visual clutter which is plaguing the aesthetic of your property; you clean everything up so that it looks nice. In some cases, trees can grow to the point that they overtake an entire property. Their branches can overshadow the yard on the property, and sometimes, even the house on the property. By trimming up the branches on your trees, you’ll provide an aesthetic balance to your yard. You might be surprised to hear that trimming up the branches on your trees can actually help to strengthen your trees. As tree branches grow out, they require more and more nutrients to survive. These nutrients are passed from the roots of the tree, to the trunk of the tree, to the branches. The longer the branches on a tree, the more difficult it is for the tree to sufficiently pass on nutrients to the entirety of the branches. By trimming up your branches, you ensure that they are able to get the proper amount of nutrients. This, in turn, strengthens your trees, allowing them to grow big and sturdy. When left to grow on their own, trees can grow in a number of different directions. While this is not a problem for trees which are out in the middle of nowhere, it can be a major problem for trees that are close to houses and other valuable entities. Fortunately, it’s possible to direct a tree’s growth patterns by trimming up its branches. As more stress is taken off one side of a specific tree, that tree will start to grow back toward the opposite side. This essentially reigns the tree in, ensuring that it’s under control and not capable of causing any damage. What good is spending a day outside if your yard is entirely covered in shade? While some shade can be nice, too much shade can ruin a yard’s atmosphere. This is why it’s sometimes a good idea to trim up the branches on your trees. Trimming up your branches will let a bevy of sunshine into your yard, making it more comfortable and inviting for all. The simple fact of the matter is that falling branches are dangerous. Not only can they cause damage to your house, car, and other possessions, they can cause damage to you, your family, and your friends as well. This is why, when your branches start to grow out too long, it’s a good idea to have them trimmed. Trimming them up will take stress off of them, ensuring that they don’t snap under pressure. Hoping to improve the overall aesthetic of your yard? Looking to aid in the health of your trees? 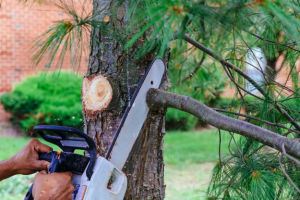 Searching for professional tree trimming in Hinsdale, Illinois? If so, we here at Smitty’s Tree and Arbor Service have you covered. We’ve been serving the Hinsdale area for over 60 years, doing everything in our power to beautify its neighborhoods. It is our goal to make your yard aesthetically-pleasing as well as functional.